Or at the very least, give the brave #WalkAway converts a platform to help them spread their word of freedom and conversion. In my opinion, it’s a perfect fit. Both movements cater to a similar demographic, say the 18 to 35 crowd, as older leftists tend to be more set in their ways, more averse to change, or frankly even opening their minds long enough to see and hear another view. WND Exclusive – WHAT IS REAL CONSERVATISM? Many of us, like me, refer to ourselves as conservatives. And that means something – something different to almost everyone. Ask a dozen people what a conservative is, and you’ll get a dozen varied answers. What exactly is the Alt-Right? We hear the term batted about a lot recently. In November, 2016, USA Today, or McPaper (h/t: Jay Severin) attempted to explain the alt-right movement. “The alt-right — short for “alternative right” — is a movement that bucks mainstream conservatism,” writes USA Today. I guess it does! If this is the case, and it appears to be, the Southern Poverty Law Center, has by its own definition, proven that the alt-right isn’t right at all. It also disproves the claim that the group could even be remotely tied to “conservatism.” One of the pillars of conservatism is “The Golden Rule,” which automatically precludes white nationalism or racial supremacy of any kind. Although polar opposites on every known and unknown political and social issue, Ted Cruz and Bernie Sanders both have one important thing in common. They are both hated by their respective party elites. No one, me included, thought at any time the fossilized socialist hippie from Vermont had any chance of unseating Hillary Clinton. But now I’m starting to wonder. Sanders is drawing tens of thousands of supporters in stadiums across the country to hear and cheer his workers-of-the-world-unite diatribe. It’s all utopian nonsense, but he enthusiastically believes it and the woefully informed Democrat base, of which there are already far too many, believe him and trust him. They can tell he’s not selling them a disingenuous line of crap, as the other Democrats do. He truly believes in the socialist model for America. The 2016 presidential election season has begun and already the left is attacking the Republicans. They have already begun to tear down our more conservative presidential candidates. Popular Wisconsin Gov. Scott Walker, who has been atop most polls recently, is a perfect example, with the lefts lame attempt to cast him as a dunce due to not completing college. Evidently that has really hindered him as the chief executive of a large state. Simultaneously, leftist insiders are feeding the press with what they believe to be winning issues for the Democrats. One such issue is income inequality, which we’ve already heard Obama pushing. Last week the LA Times wrote a piece entitled “Income inequality emerges as a key issue in 2016 presidential campaign.” Has it really? Of course it has, because the left feels it’s a winning issue. When I first heard this, I thought the article was about Catherine Coulter, the mystery writer. doesn’t like the competition from a politician who can out-snot her. Who is Coulter supporting? Romney. You all know the run-down on Romney. This is not to say that Gingrich doesn’t have his own load of excess baggage. What many people like about Gingrich is that he’s not afraid to take on the media. Something has happened to Coulter in the past year or two. She began to move leftward. Maybe she was trying to broaden her speaking options. She used to get pies in the face by liberal groups. Now she’s invited to speak at their conferences. 2010. This engagement resulted in her removal from World Net Daily’s “Taking America Back” conference. It is unfortunate that Coulter is willing to be a vehicle of legitimacy for a group that certainly goes against the foundation of conservatism. 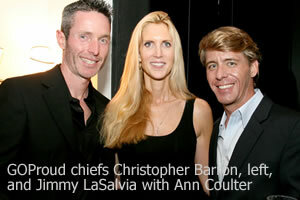 Soon after, Coulter joined the board of the pro-homosexual GOProud. 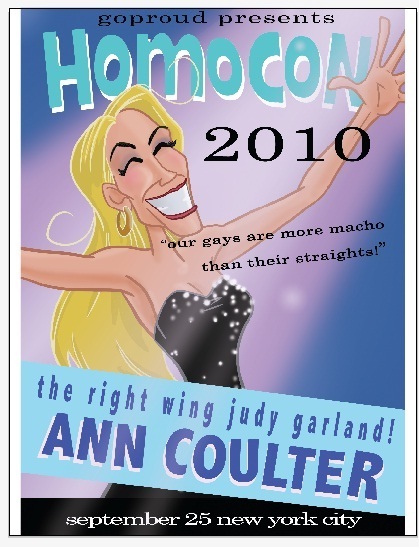 “I am honored to serve in this capacity on GOProud’s Advisory Council, and look forward to being the queen of fabulous,” Coulter said in a statement. Coulter can’t be trusted as a reliable conservative voice.